What is Granite? What is Granite Used For? 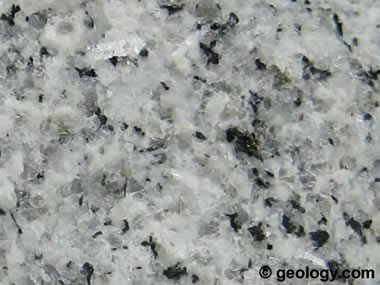 Granite: The specimen above is a typical granite. It is about two inches across. The grain size is coarse enough to allow recognition of the major minerals. The pink grains are orthoclase feldspar, and the clear to smoky grains are quartz or muscovite. The black grains can be biotite or hornblende. Numerous other minerals can be present in granite. 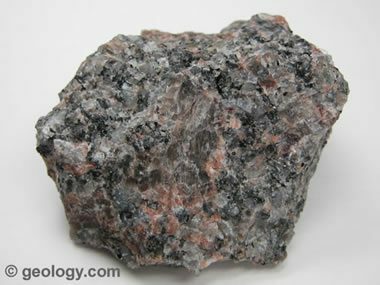 Granite is a light-colored igneous rock with grains large enough to be visible with the unaided eye. It forms from the slow crystallization of magma below Earth's surface. Granite is composed mainly of quartz and feldspar with minor amounts of mica, amphiboles, and other minerals. 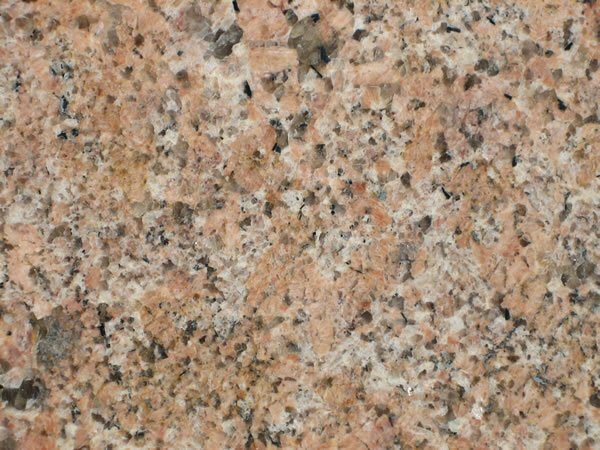 This mineral composition usually gives granite a red, pink, gray, or white color with dark mineral grains visible throughout the rock. 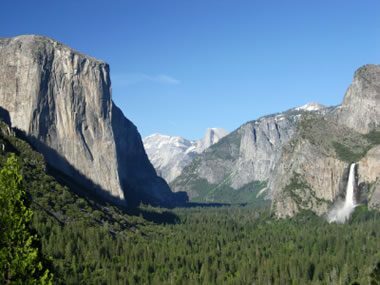 Granite in Yosemite Valley: Photograph of Yosemite Valley, California, showing the steep granite cliffs that form the walls of the valley. Image copyright iStockphoto / photo75. 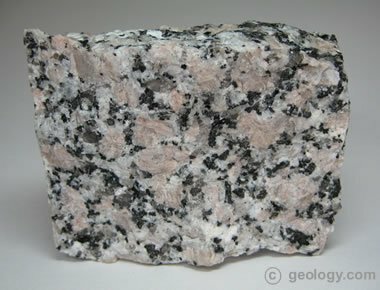 Granite is the best-known igneous rock. Many people recognize granite because it is the most common igneous rock found at Earth's surface and because granite is used to make many objects that we encounter in daily life. These include counter tops, floor tiles, paving stone, curbing, stair treads, building veneer, and cemetery monuments. Granite is used all around us - especially if you live in a city. Curling stones are made from special types of granite. Granite is also well known from its many world-famous natural exposures. These include: Stone Mountain, Georgia; Yosemite Valley, California; Mount Rushmore, South Dakota; Pike's Peak, Colorado; and White Mountains, New Hampshire. Yosemite Nature Notes - Granite: This video examines some of the granites that create the scenery and climbing pleasures of Yosemite National Park. 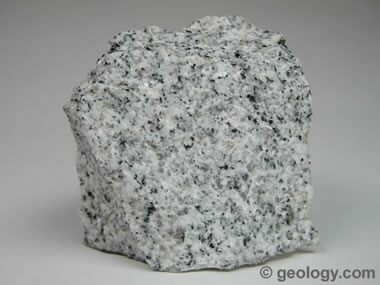 Granite: Photograph of a white, fine-grained granite. This specimen is about two inches across. 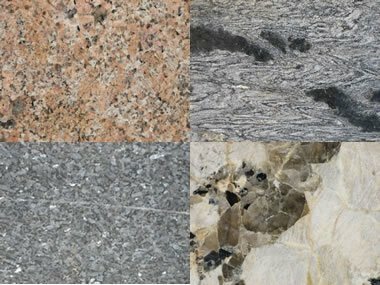 The word "granite" is used in a variety of ways by different people. A simple definition is used in introductory courses; a more precise definition is used by petrologists (geologists who specialize in the study of rocks); and, the definition of granite expands wildly when used by people who sell dimension stone such as countertops, tile, and building veneer. These multiple definitions of granite can lead to communication problems. However, if you know who is using the word and who they are communicating with, you can interpret the word in its proper context. Three common usages of the word "granite" are explained below. Granite composition chart: This chart illustrates the generalized mineral composition of igneous rocks. Granites and rhyolites (compositionally equivalent to granite but of a fine grain size) are composed mainly of orthoclase feldspar, quartz, plagioclase feldspar, mica, and amphibole. Many rocks identified as "granite" using the introductory course definition will not be called "granite" by the petrologist - they might instead be alkali granites, granodiorites, pegmatites, or aplites. A petrologist might call these "granitoid rocks" rather than granites. There are other definitions of granite based upon mineral composition. The accompanying chart illustrates the range of granite compositions. From the chart you can see that orthoclase feldspar, quartz, plagioclase feldspar, micas, and amphiboles can each have a range of abundances. 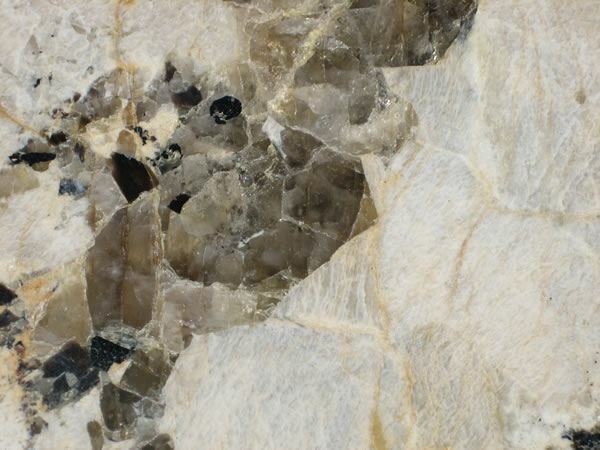 Pegmatite: Photograph of a granite with very large crystals of orthoclase feldspar. 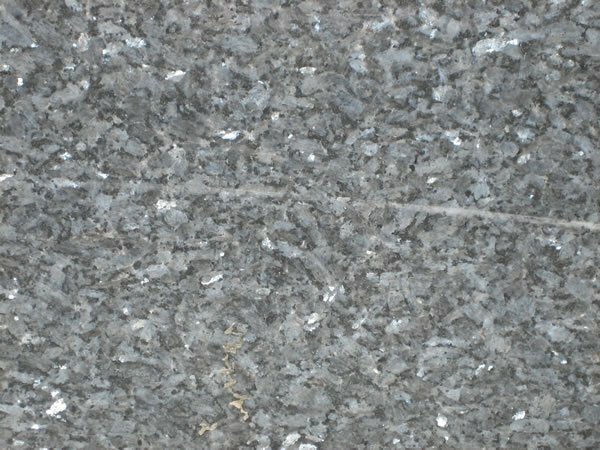 Granites composed mainly of crystals over one centimeter in diameter are known as "pegmatites." This rock measures approximately four inches across. Azurite Granite, also called "K2 granite," is sometimes used as a gemstone. In the commercial stone industry, a "granite" is a rock with visible grains that are harder than marble. Under this definition, gabbro, basalt, pegmatite, schist, gneiss, syenite, monzonite, anorthosite, granodiorite, diabase, diorite, and many other rocks will be called "granite." Granite counter tops: Granite counter tops in a new kitchen. Image copyright iStockphoto / Bernardo Grijalva. Mount Rushmore: Mount Rushmore in the Black Hills, South Dakota is a sculpture of United States presidents George Washington, Thomas Jefferson, Theodore Roosevelt, and Abraham Lincoln sculpted from a granite outcrop. Image copyright iStockphoto / Jonathan Larsen. 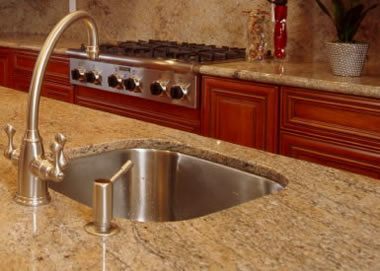 Explore the many uses of granite! Granitic rocks: This triangular diagram is a classification method for granitic rocks. It is based upon the relative abundance of feldspars (K-Na-Ca) and quartz. Mafic elements are not considered. It is modified after a classification chart prepared by the International Union of Geological Sciences. Image and modification by the United States Geological Survey. Most introductory geology textbooks report that granite is the most abundant rock in the continental crust. At the surface, granite is exposed in the cores of many mountain ranges within large areas known as "batholiths," and in the core areas of continents known as "shields." The large mineral crystals in granite are evidence that it cooled slowly from molten rock material. That slow cooling had to have occurred beneath Earth's surface and required a long period of time to occur. If they are today exposed at the surface, the only way that could happen is if the granite rocks were uplifted and the overlying sedimentary rocks were eroded. In areas where Earth's surface is covered with sedimentary rocks, granites, metamorphosed granites, or closely related rocks are usually present beneath the sedimentary cover. 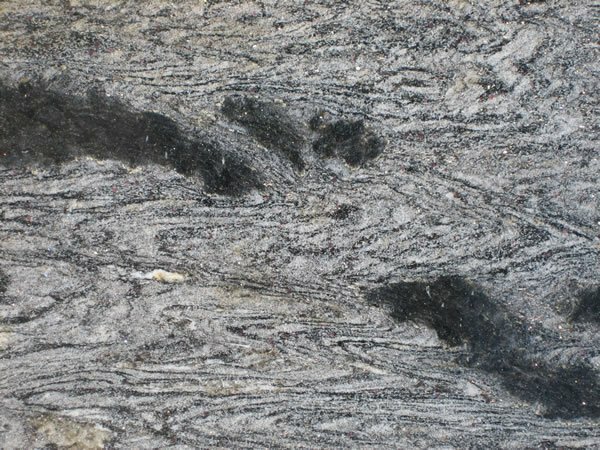 These deep granites are known as "basement rocks."